Hi Lovelies. Today Ive got a private vintage pamperbox session where I will showing a client how to turn themselves into a vintage vixen with just the contents of their make up bag. I'm feeling rather Rockabilly fabulous so have gone for a leopard print dress and head scarf. My hair is in a victory roll and Ive clipped some longer extensions in as well to give me a bit of mane. Ive applied a strong brown based eyeshadow with french flicks and pale lips-I think on reflection red lipstick would have worked better.Ive knotted a fairly ordinary black cardigan so it creates a bit of a waist shape-this is a trick I use all the time, that and using wide belts, giving the illusion of a waist where there is actually none. Can you wear too much animal print-I don't think so! Remember feeling good and looking great has nothing to do with dress size and everything to do with attitude. Never wait to be a certain weight to start enjoying clothes and never reject anything thinking it wont suit your shape. Try it on-you may be surprised. 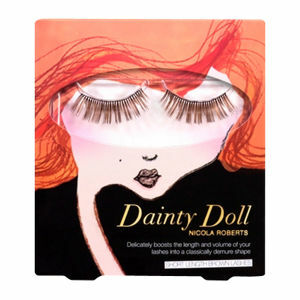 I have a lovely set of Dainty Doll eyelashes to giveaway. Leave a comment on Tuesdays post.